If you want to know all the ins and outs of journal time, watch the video. Otherwise, here are my 3 favorite ways to journal. 1) Let the crap out! This journal session is where you let out all the nasty stuff. Be as angry, sad, critical as you need to be. Let the frustrated or hurt voice be heard without judgment. The important piece is witnessing and validating your hurt part’s voice without taking it as the whole truth of the situation. This lets you get the muck out and move some energy! 2) Free write. This is where I let a complete stream of consciousness flow without filtering anything. It might sound like the above example, but here you’re usually less emotionally charged and you’re just letting your mind roam and talk about anything that’s right here. Don’t even punctuate this style of journaling, just let it flow! 3) Prayer. Sometimes I need to feel connected to Source/God and in order to feel that, I’ll begin talking to that energy. I will also blend some meditation into this experience by feeling my breath and my body and remembering my body and my body’s energy are supported by Source energy. This allows me to build an emotional & physical connection to spirit. If you want to learn more, watch the video! Otherwise, try one of these methods one time this week and see how it feels. If you want to email me your journal questions, I would be happy to help you develop this practice. I’ve been journaling for 18 years and it’s been so life giving for me! 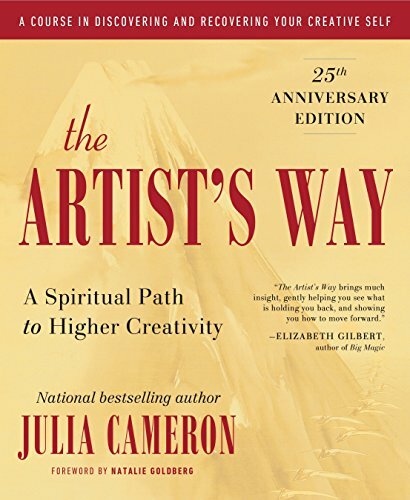 One of my favorite books to develop your writing practice is The Artist’s Way by Julia Cameron! Our reality becomes known to us by what we pay attention to. Each moment, we are creating something that blocks our connection to life itself OR lets life flow through us. I don’t know about you, but the latter feels much better. The hard part is, we get so accustomed to viewing life from our fix-it/problem lens that before long, our life seems like a series of fires we have to put out or to-dos we need to keep up with. And the repetitive cycle of doing the same thing over and over and the heaviness of our problems starts to become all there is. Its like painting and only being able to use gray; after a while things all start to look and feel the same. So I want you to feel in your body the heaviness. I want you to stop and close your eyes —I’ll wait right here—just notice the physical sensations of heavy. Notice what the story sounds like, “What’s wrong with me? Why do I feel this way? How am I going to keep up? How am I going to get everything done?” Don’t try to change a thing about you, for right now just allow this story to be heard and connect to where you feel it in your body. This too, is aliveness. This very sensation—heaviness—is aliveness. It’s the intelligence and wisdom of your body grabbing your attention. Only instead of trying to make you feel like garbage, it’s trying to wake you up. Pay close attention here: what you’re feeling in your body is a byproduct of the map and script you are using.